The kind of work that has your fingerprints all over it. The kind of work that you’d never compromise on. That you’d sacrifice a weekend for. You can do that kind of work at Apple. People don’t come here to play it safe. They come to swim in the deep end. The message is clearly inspiring while also demonstrating the demanding nature of work at Apple, which helps to explain why their products are so refined and ultimately enjoyable for all of us to use. This was found on HackerNews, which has a mostly negative response to the note. What do you think, good or bad? It’s a great message. Why settle for second best when it’s up to you to do your best? I personally think this is a great message. If every US company followed this, we would be overall in a helluva lot better economic condition. To Daniel R, who says “there’s more to life than work…” That is EXACTLY the point Apple is trying to convey. It is about fully realizing one’s own potential, through hard effort that is pioneering vs. brain-numbing. At my former company, we had a similar message, telling people that “we want this job to be the best job of your life.” And it worked. I think the whole passage’s point is to place this phrase. GG expectations. Our CEO has a different way to encourage sacrifice: “I don’t expect you to work on Sunday.” I’m pretty much alone when I’m in on SATURDAYS, so either my co-workers are pretty dense or they’re pretty smart (and I’M the fool). This is a good way to encourage people to do their best. If people hate what they do and hate their job, they will leave, it’s that simple. People should follow Apple’s direction, and by people I mean managers! I consider it pure corporate bullsh**. Back in the late 1970’s when you actually had a choice of jobs, a message like that would have encouraged me to go somewhere else in search of even higher pay. Every company that I’ve ever worked for that was worth anything — Akio Morita’s Sony, Oracle in the early days, a few good startups — had some variation on this. Few of them put it in writing, and few did so as eloquently and efficiently as Apple here. That tells us something else about the company, doesn’t it? If you’re not willing to push yourself, to work smart rather than merely hard, to make the things you can better because you could make them so, then you’ll quite probably be happier and more successful in some middle-of-the-Fortune-500 globocracy. If that’s not you, if you believe that each of us is personally, individually, solely responsible for those things in the world around us that we have the capacity to improve, then roll up your metaphorical sleeves and let’s get to work. Earle Jones, I agree with the sentiment. Excellence, or the diminishment thereof, is half of the problem that has laid America low these past decades. Decentralizing power, returning to something Madison would recognize as a functioning republic, is the other, of course. In other words, when you work for Apple, THEY OWN YOU. Maybe Apple should put this message in the interview rooms where potential hires could see it. To give those who do not like it the opportunity to walk out right away. I was fortunate enough to work most of my life for companies who had similar attitudes. True, I sometimes worked long hours (without extra pay), but I enjoyed my work, and am still proud of how I helped these companies to achieve their aims. “Fancy working long hours and at weekends WITH NO EXTRA PAY? You just found the place. At Apple we are proud not to share any promille of our enormous earnings with our staff beyond their pre-agreed salaries. I actually absolutely love this message from Apple HQ. I’ve been marveling at the commentary on the various sites I’ve seen covering this image. It’s like people aren’t getting it. If you do what you love, you will go the extra mile, because what you do matters to you on a deep soul-level. You will want to finish it, and do it as well as you ever can – and then go back and improve on it. Why? Because the work you love is as much a part of you as your hands are a part of your body. It’s an extension of your mind! Walter Russell lectured about this back at IBM in the 1930s, and I’ve found his lectures and articles to be extremely inspirational. I recognized the same theme and timbre in this Apple writeup. I think the people who have issues with this kind of material, are the people who are incapable of ever receiving the message or being inspired by it – i.e., they’ve already flatlined on the inside. They can go sit in the corner and let the people who actually create things on this planet get inspiration from whichever source they want, and then these inspired people go and create inspired things, inspired extensions of their mind. 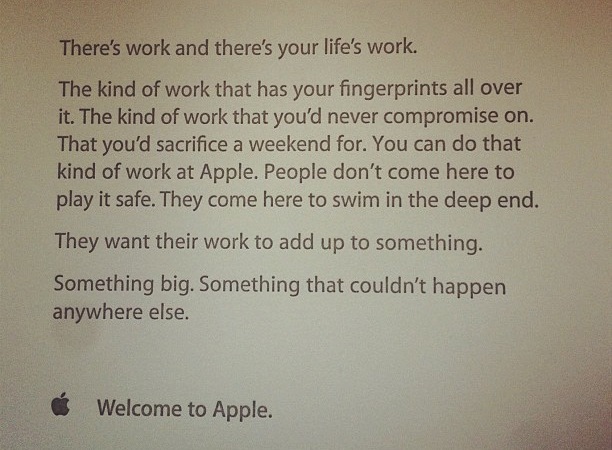 TL;DR: Apple has it right with their new-employee-message. Inspiring words and true, through pressure we all make things better.